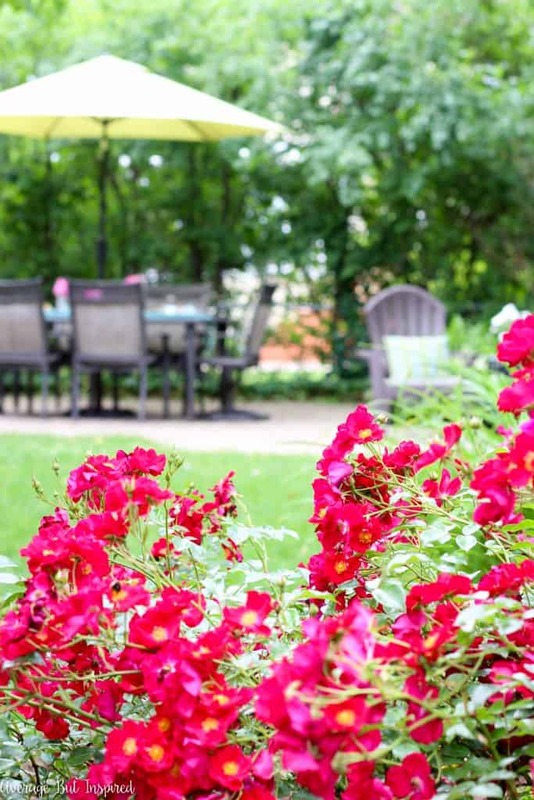 I’m so excited to show you a part of my home that I’m pretty sure I have never shared before – my backyard! OK, well I’m not showing you the whole backyard . . . just the patio. But really, there’s not much more to see since my yard is the size of a postage stamp. 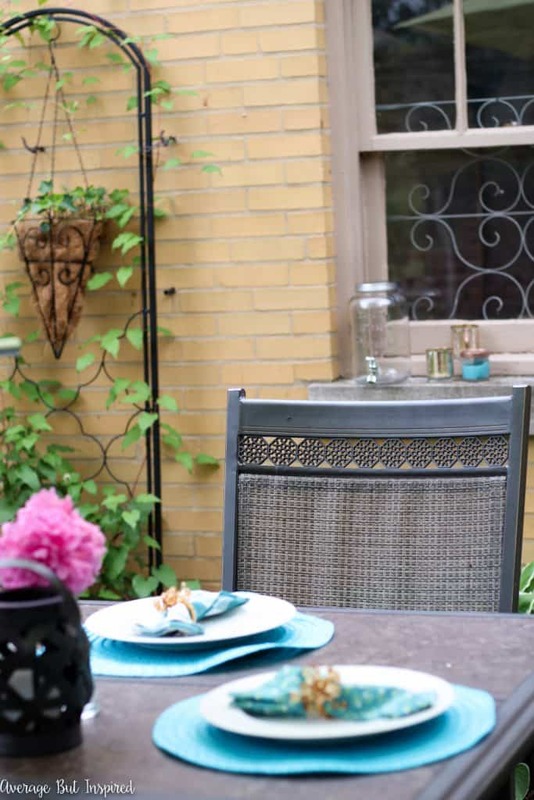 Even though there’s not a lot of space, we make the most of our urban backyard patio, and I am happy to be sharing it as part of the Garden Tour Blog Hop that was organized and hosted by my friend Tara at Lehman Lane. We have a nice dining area where we love to enjoy meals with the family or friends, and then a cute little sitting area off to the side where we lounge and light a fire once in a while. 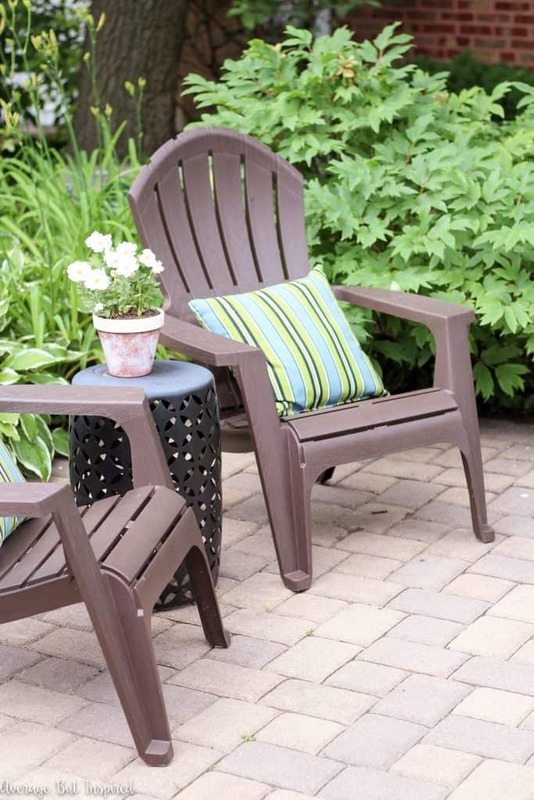 And the outdoor pillows (linked to similar pillows) dress up the very practical and easy-to-clean-bird-poop-off-of plastic adirondack chairs. I tried to convince my husband we needed an outdoor sofa out here, but he didn’t bite. Although the yard was a jungle when we bought our house, I am grateful for the massive amount of peony bushes the previous owners planted. They are all over the yard and are just stunning. And I’m pretty darn proud of the clematis vine I’ve been growing the past couple of years. It’s actually thriving, which is shocking to me. 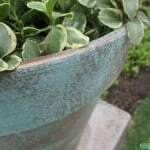 Apparently those are finicky, so it’s a wonder that my black thumb hasn’t killed it yet. (I hope I’m not jinxing myself by writing this.) 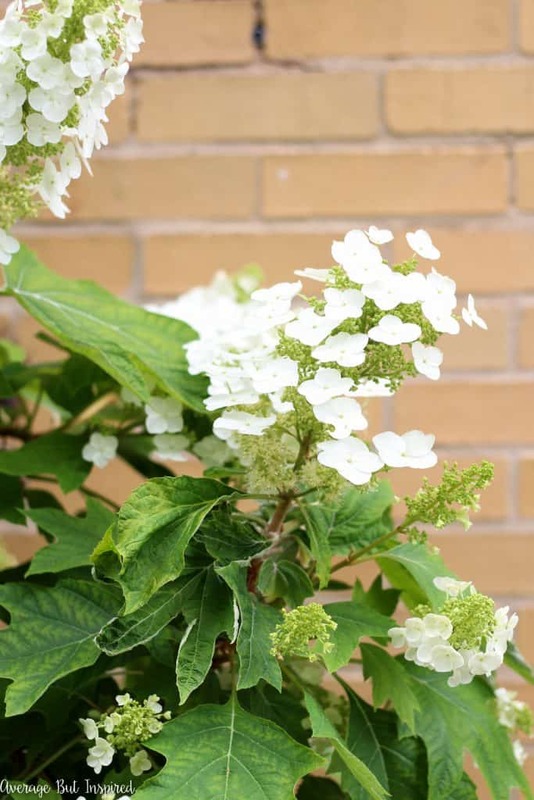 Another favorite plant of mine is our giant oak leaf hydrangea. 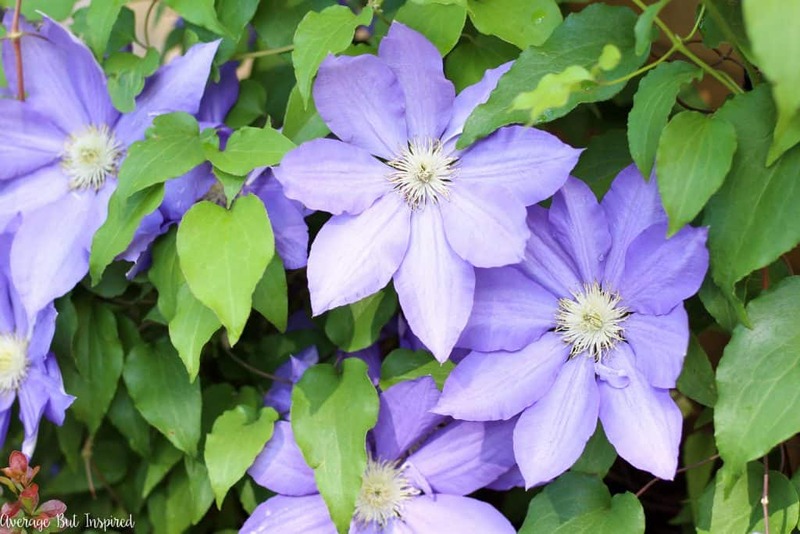 It’s super low-maintenance, but produces the most gorgeous blooms. All of these pretty flowers make me feel like I’m not as close to the city as I am (head two blocks north and you’re in Chicago). And that makes enjoying my patio that much better. 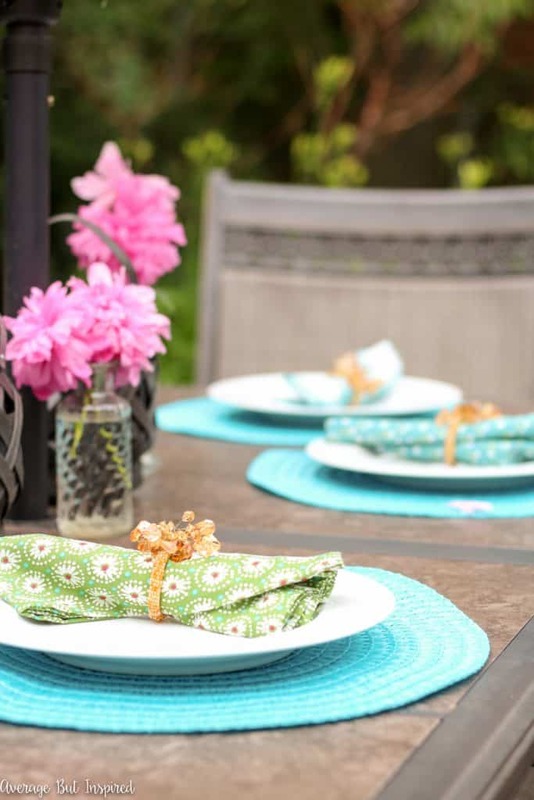 Flea market inspired table decor like these aqua round placemats, adorable mix and match fabric napkins, and woven candle holders also help relax the setting and make it feel less urban to me. 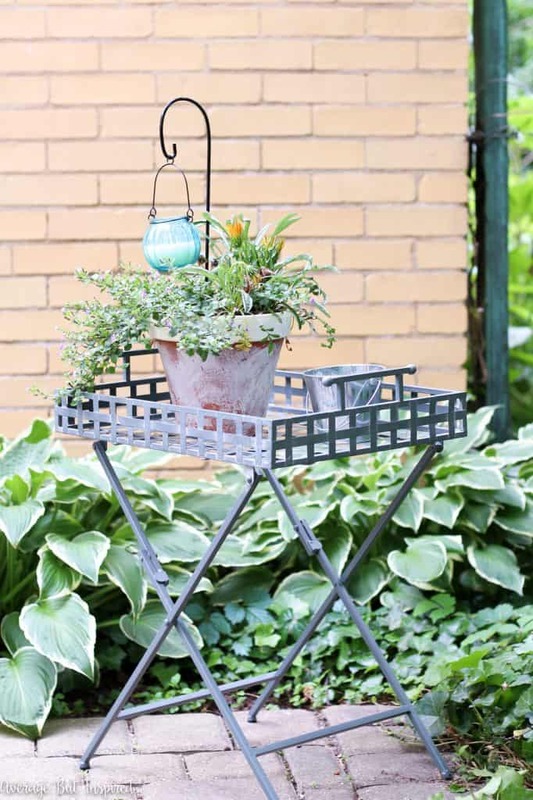 And this little plant stand in the corner is perfect for adding some height and color to the patio. 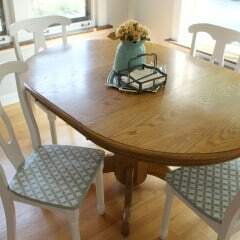 Plus, it doubles as a serving stand, which I love! I’m so glad I had a reason to show you my backyard today! 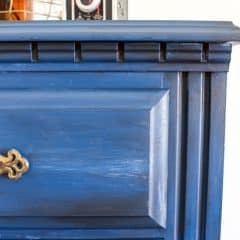 If it weren’t for this blog hop, I probably would never have posted about it. I hope you enjoyed taking a look around! 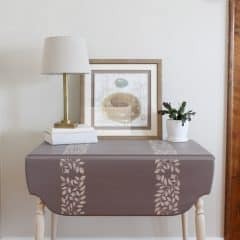 And if you liked any of the decor items I featured, you can click here to shop or learn more about them. 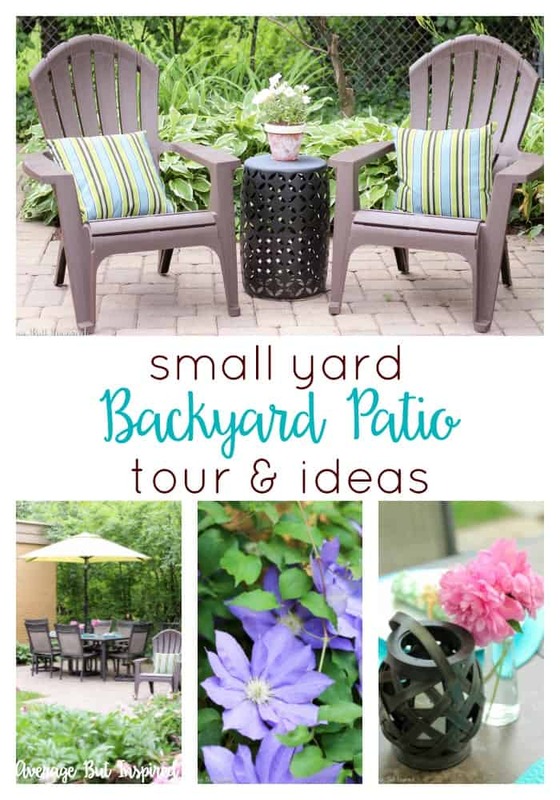 Please also be sure to check out some of the other beautiful backyard spaces that are being shared today, too. 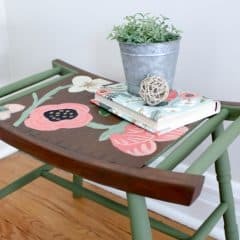 You can visit their posts by clicking below, and you can search for all of the other garden spaces that are part of this hop by searching for #gardentourbloghop on social media! 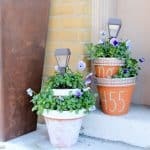 Bre – your patio is beautiful! You should definitely showcase it more 🙂 Are we allowed to say how jealous we are of all of your gorgeous peonies? And the oak leaf hydrangea is just as pretty! Love all of your personal touches – we can see why you love to entertain here…lovely space! 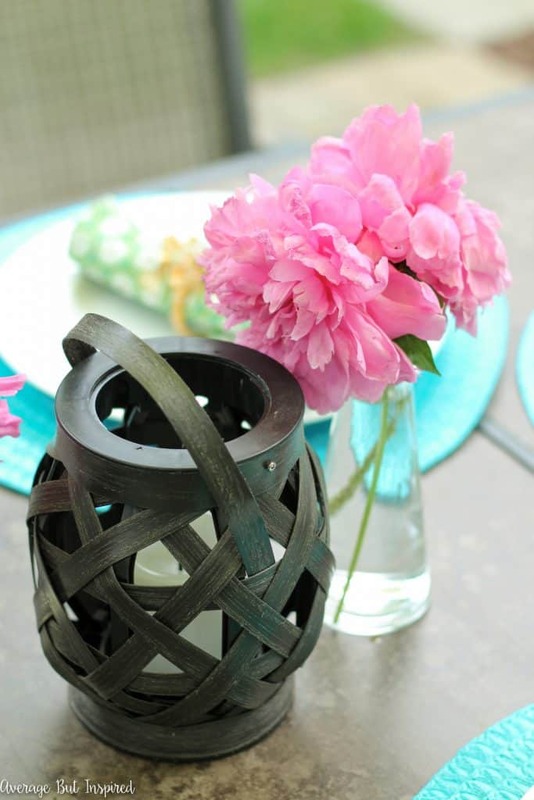 I love those peonies! Omg. So jealous. It all looks so inviting and pretty. SUCH a peaceful and relaxing space! LOVE all of the gorgeous greens and flowers! I love it, Bre! It’s so beautiful and serene! I love the place settings and all the gorgeous flowers! 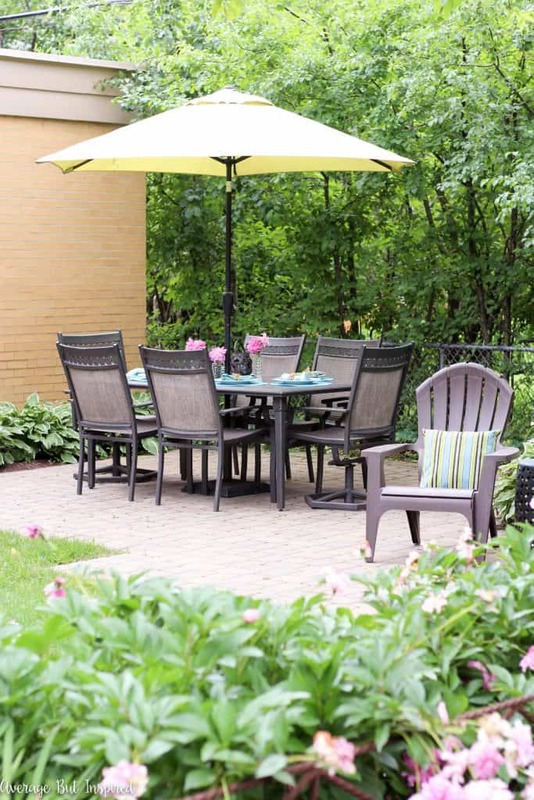 Your patio looks so pretty and relaxing! I especially love all your plants. Everything is so pretty! You’ve done a great job with a small space. And I just love that little plant stand. My backyard is small too. I sometimes think small spaces are the most charming! Yours is very pretty and I love that yellow umbrella! 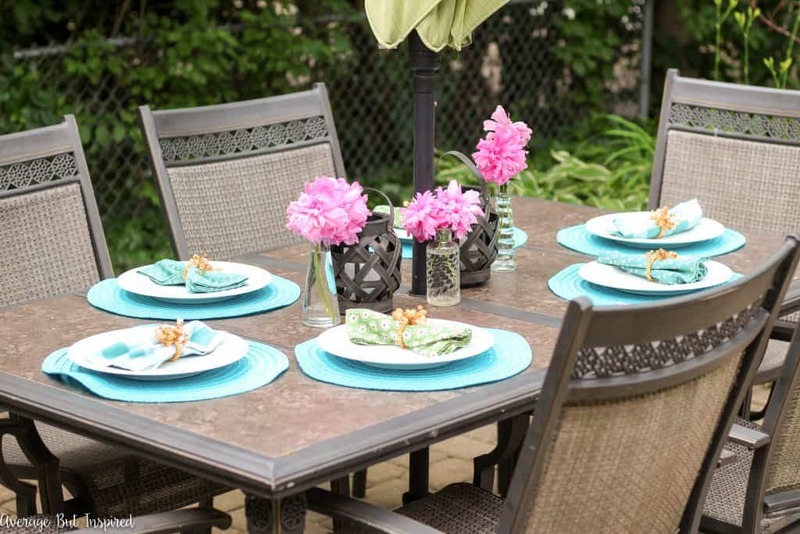 Your outdoor patio is so pretty Bre! You guys did a great job and it was smart to place it a little away from your neighbors for more privacy:). We must have the same taste in flowers because you planted so many of my favorites. Beautiful space! 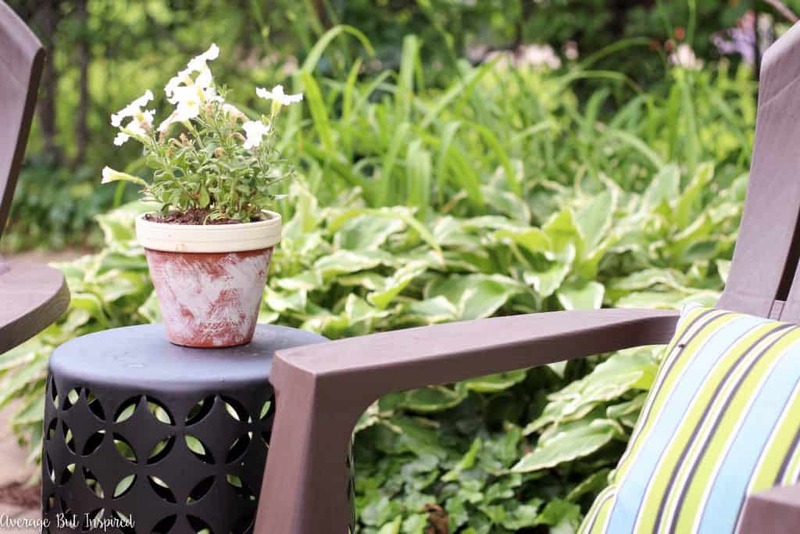 Your outdoor spaces are lovely. I especially like the pretty oak leaf hydrangea and peonies. How lucky that your property came with so many mature peonies. Thanks for the tour. I love your backyard, you have such pretty flowers! Those little candle holders are so cute. 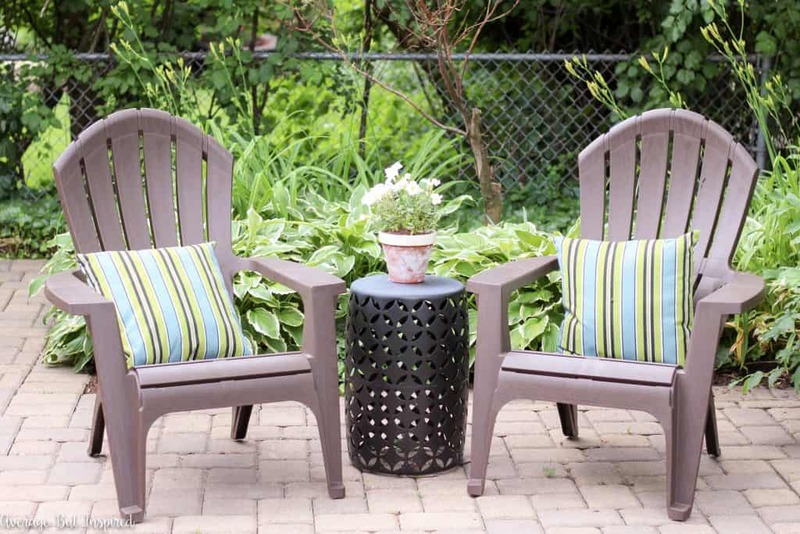 And that garden stool IS perfect for a couple of wine glasses! 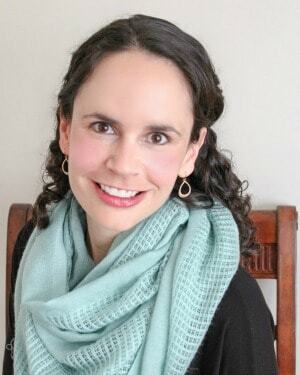 I absolutely love your patio space – it feels so private and cozy! 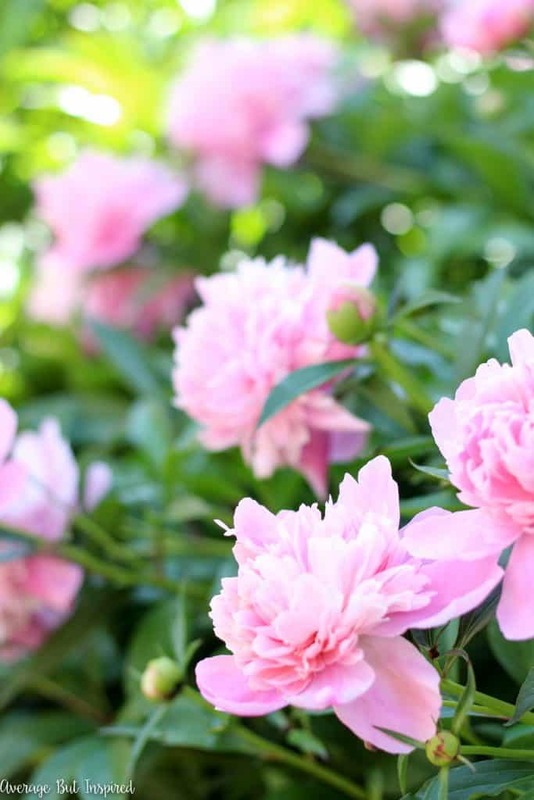 And your peonies look incredible!! I’m so glad you shared this with us! It’s all so beautiful! I love your pretty patio! The place settings, flowers and decor are all beautiful! Enjoy your summer! I love your backyard, Bre! Those peonies are so gorgeous. Like you, I am so glad the previous owners of our house planted them in our yard too. You did a wonderful job “dressing up” your table. Looks so inviting! Your backyard is BEAUTIFUL, Bre! And the patio looks so inviting. I just wanna sit down and have a glass of wine while looking at all of those pretty flowers!